Get your hands off my Temaki! You remember our sushi night at Clark?? I do, and it was so much fun making our own creations and then sharing them all amongst ourselves! Take large sheet of seaweed, fold in half, fold in half again, to form 4 equal squares. Take one of these smaller squares and spread 2 tbsp sushi rice, on the rougher side of the seaweed sheet, in a diagonal direction, from bottom left to top right corner. 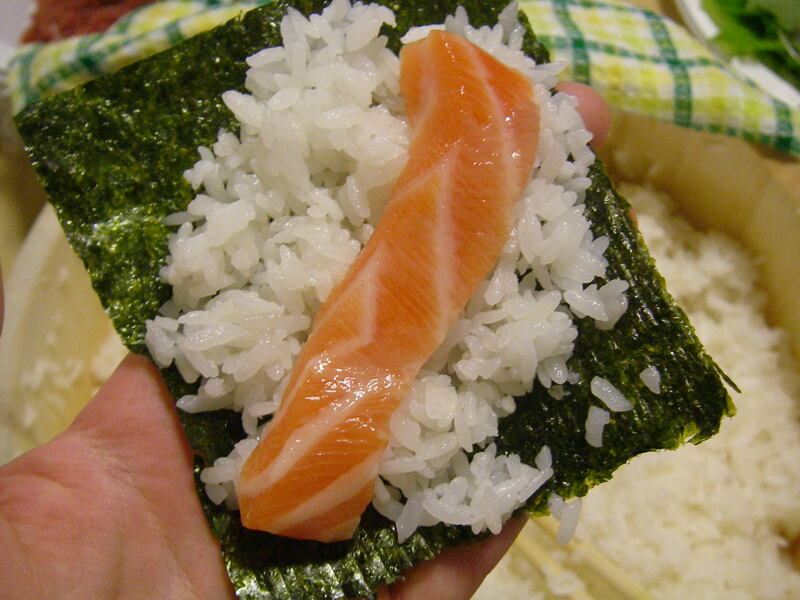 Place salmon and avocado slice diagonally, on top of rice. Now we are going to form it into a cone, which is the trademark look that distinguishes this roll from the others! Take bottom right corner and roll it out, keeping the open (flared out) side to the right. Roll the seaweed and contents towards the middle of the diagonal, keeping the bottom left corner as pointy and tightly wound as possible. Then bring top left corner towards the center, again keeping the open (flared out) side to the right, rolling it tightly towards the right so as to finally formf a sharp cone shape roll. Slightly wet fingers with a very small amount of water, to seal the cone into shape. 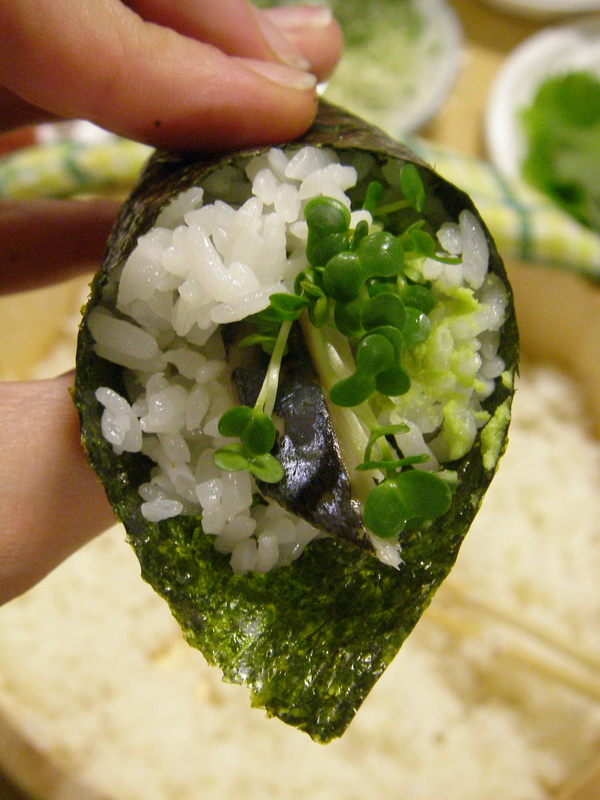 Season your soy sauce with desired amount of wasabi, dip your roll and eat! To clean and prepare your palette for a new flavour, have a piece of pickled ginger. If you really want to make your own sushi at home with safe raw fish, a more expensive but easy option is to order sashimi pieces from any sushi restaurant that delivers! As I try my hand at these rolls at home, I will post ideas of fun rolls, but you should feel free to be creative with the contents of your sushi, try putting sprouts, carrots, mango, shredded raw beets, fried calamari(for a crunch), strips of omelet, cream cheese. The possibilities are endless!